At press time, the news of the oil refinery explosion in MR/EN's neighboring borough of Staten Island, NY has rocked not only New York City and its environs, but once again proven the tenuous hold that is sometimes had in the process of delivering petroleum products by ship and barge. Piecing together scattered first-hand and wire reports, it is alleged that the cause of the explosion was a barge belonging to Hicksville, N.Y.- based Bouchard Transportation Co. that exploded while workers were offloading 100,000 barrels of unleaded gasoline off the Bouchard B#125 barge at the ExxonMobil Port Mobil Terminal in Staten Island. Killed in the blast were two longtime Bouchard employees, John Kyne, of Huntsville, Ala., who worked for the company for 18 years; and barge mate Ford Ebanks, of Miami, Fla., who had been with Bouchard for 2.5 years. The explosion led to a massive (and ongoing) clean up effort organized via the U.S. Coast Guard and Clean Harbors, who were mobilized almost immediately after the barge exploded. The USCG began its clean up effort via a Captain of the Port order, which called for the temporary shut down of Arthur Kill in the Port of New York/New Jersey — between Ward Point and Tufts Point. Later on that day, once the fire was under control, the order was modified as to provide minimal disruption in this often crowded shipping lane. Beginning work after the fires were extinguished, Clean Harbors went to work with the USCG, who also established a unified command system at USCG Activities New York, which included the continual assessment of the environmental impact of the fire and spilled fuel. Accidents such as this one, as well as the break up and sinking of the tanker Prestige off the coast of Spain late last year have brought the maritime industry to the forefront of the public and legislators, which means new or heightened legislation is sure to follow. 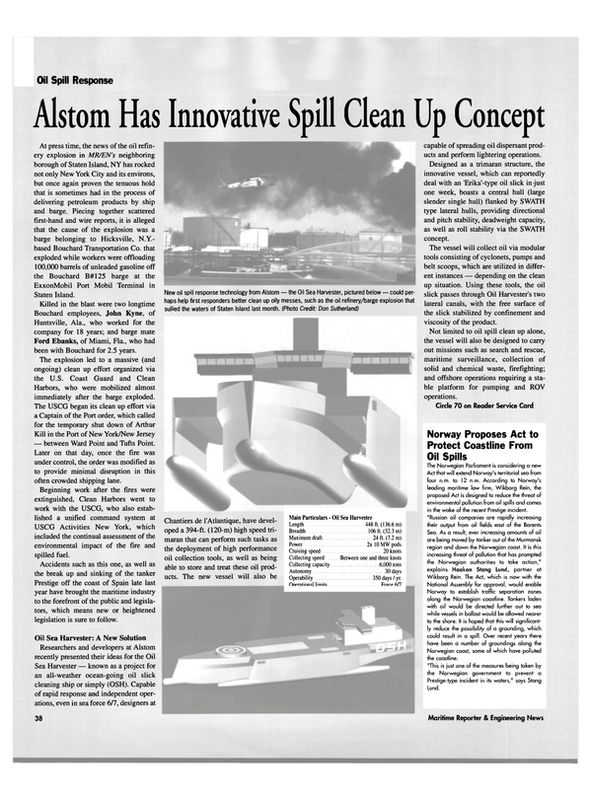 Oil Sea Harvester: A New Solution Researchers and developers at Alstom recently presented their ideas for the Oil Sea Harvester — known as a project for an all-weather ocean-going oil slick cleaning ship or simply (OSH). Capable of rapid response and independent operations, even in sea force 6/7, designers at capable of spreading oil dispersant products and perform lightering operations. Designed as a trimaran structure, the innovative vessel, which can reportedly deal with an 'Erika'-type oil slick in just one week, boasts a central hull (large slender single hull) flanked by SWATH type lateral hulls, providing directional and pitch stability, deadweight capacity, as well as roll stability via the SWATH concept. The vessel will collect oil via modular tools consisting of cyclonets, pumps and belt scoops, which are utilized in different instances — depending on the clean up situation. Using these tools, the oil slick passes through Oil Harvester's two lateral canals, with the free surface of the slick stabilized by confinement and viscosity of the product. Not limited to oil spill clean up alone, the vessel will also be designed to carry out missions such as search and rescue, maritime surveillance, collection of solid and chemical waste, firefighting; and offshore operations requiring a stable platform for pumping and ROV operations.